ReutersBrazilian billionaire Eike Batista (R), CEO of EBX Group and Michael Dolan, CEO of IMG Worldwide shake hands after a news conference for the launched the IMX Sport and Entertainment company in Rio de Janeiro December 9, 2011. 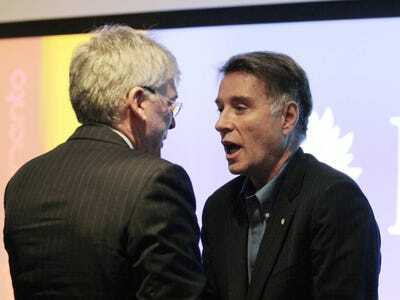 If Eike Batista goes to jail for insider trading, he’ll be the first person in Brazil to do so. He’ll be the first person in Latin America to do so. He may, however, not be the first person who once claimed he’d become “the richest man in the world” to do so. The trial starts on Tuesday in a country where class issues have dominated the conversation since protestors filled the streets before the 2014’s World Cup. In the presidential election the country held last month, class was brought up time and time again by the populist incumbent, Dilma Rousseff. Brazil is a place where the rich and the poor have historically lived by a separate set of rules. But it’s also a place that has been trying to change all that — to strengthen the rule of law and create a transparent system. So at this insider trading trial Batista will not be the only one on display, Brazil’s successful development as country will be on display as well. In many ways Batista has always been the perfect poster boy for this. Back in 2012 when he said he would become the richest man in the world it seems he was actually well on his way. At that point he was lucky number 7 with assets valued at around $US35 billion. ReutersBrazilian billionaire Eike Batista (L), CEO of EBX Group, greets Brazil’s President Dilma Rousseff during a ceremony in celebration of the start of oil production of OGX, Batista’s oil and gas company, at the Superport Industrial Complex of Acu in Sao Joao da Barra in Rio de Janeiro April 26, 2012. What’s more, Batista built his business building Brazil. His holding company EBX, contained a half dozen closely connected companies that focused on shipping, mining, logistics and more. The crown jewel of this was OGX — an oil and gas company — and Batista was the “pride of Brazil” loved by politicians and pop culture alike. It was OGX that would ultimately bring the entire the empire down. The fields that Batista christened ‘Hammerhead’ and said were brimming with black gold just under the surface turned out to be dry. The insider case against Batista rests on whether or not he knew that his fields wouldn’t yield, but manipulated the market in order to buy himself time to potentially save his companies. When it was suspected that OGX’s fields were not going to deliver as promised, Batista said that he personally would commit $US1 billion to keep the company afloat. The stock, which was plummeting, stabilised. Once the worst suspicions about OGX were confirmed, however, prosecutors allege that Batista started selling his stock in the company. Then he backed out of his $US1 billion promise saying that the company had re-written its rules and relieved him of the responsibility. OGX, meanwhile, was the largest corporate bankruptcy in Latin American history and Wall Street was in up to its eyeballs. PIMCO, BlackRock and even Abu Dhabi’s sovereign wealth fund had all invested in Batista. Furthermore, as went Batista, so went Brazil. From the time all the trouble started in late 2012 to the summer of 2013 — right before OGX went bankrupt — Batista’s companies lost combined $US9.7 billion. All 300 publicly traded companies in Brazil lost $US203 billion in about the same period. Batista was forced to sell a bunch of his assets, like his yachts, planes and the prized Lamborghini he kept in his living room. Other holdings were transferred to his son and wife. Not exactly the moves of a man who is bullish on his own outcome. Batista’s lawyers tried to get this insider trading trial suspended, but it hasn’t worked. Nothing they have done — in a country where the wealthy have been known to file appeal after appeal to keep themselves out of Court — has worked. For his part, Batista is vowing a comeback. According to the Financial Times he partly blames the government for his misfortune in a new autobiography. He’s also made a $US12 million deal with a South Korean pharmaceutical company, C.L. Pharm, and bought the rights to open a lab in Brazil. Hwang Woo-suk, the South Korean scientist behind C.L., wants to clone dogs. In 2005 he cloned a dog named Snuppy but was then accused of faking research on stem cell cloning. Hwang did not respond to the FT’s requests for comment.